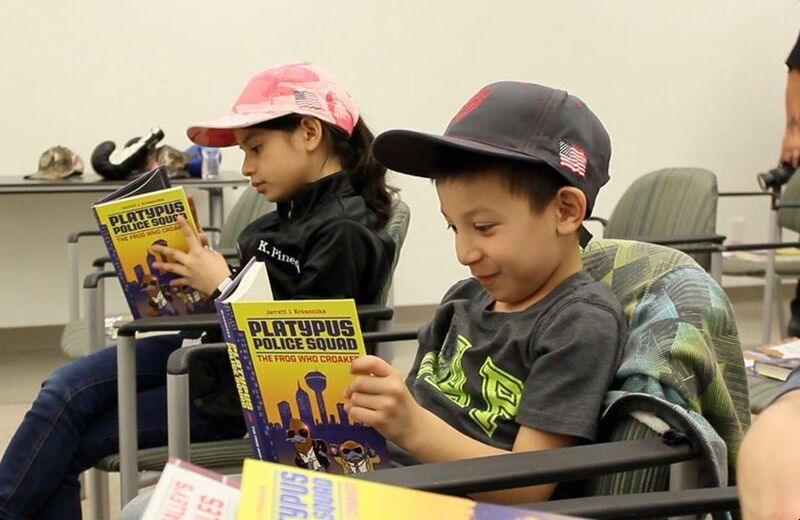 In May 2014 I celebrated the release of the second installment in the Platypus Police Squad series at the Cambridge Public Library in Cambridge, Massachusetts. As part of the program, I read aloud from the third chapter of The Frog Who Croaked, the first book in the series. It’s my favorite chapter. Detective Rick Zengo, the hot-shot young rookie, is riding in the unmarked squad car for the first time, and his eagerness contrasts with the irritability of his new partner, Detective Corey O’Malley—the grizzled old vet of the force. It sets up their classic big brother/little brother odd-couple relationship. Joining me in the read-aloud were two old friends of mine, Trooper Chris Zengo and Detective Corey McGrath. Their names sound familiar, don’t they? I named the monotreme detectives after my old friends. When I initially conceived the book series, both friends were graduating from the police academy, and I would often seek out their advice. As a thanks for their help, they got platypuses named for them. Seemed fair. 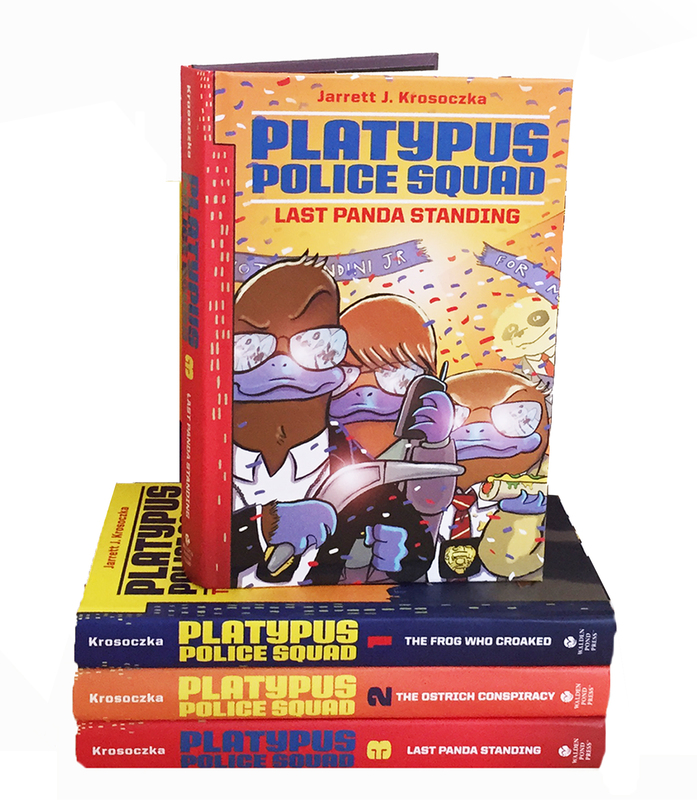 Nine years after the initial brainstorm, final copies of Platypus Police Squad: The Frog Who Croaked arrived, and I sent my first finished copies to my old pals. Something tragic and horrific had happened in the interim. The Boston Marathon bombing had shaken the city, the country, and the world to their core. And my friends, then officers, worked at the MIT Police Department and the Watertown Police Department. To have Trooper Zengo and Detective McGrath at the reading was remarkable. For one, I was happy that my friends were alive. 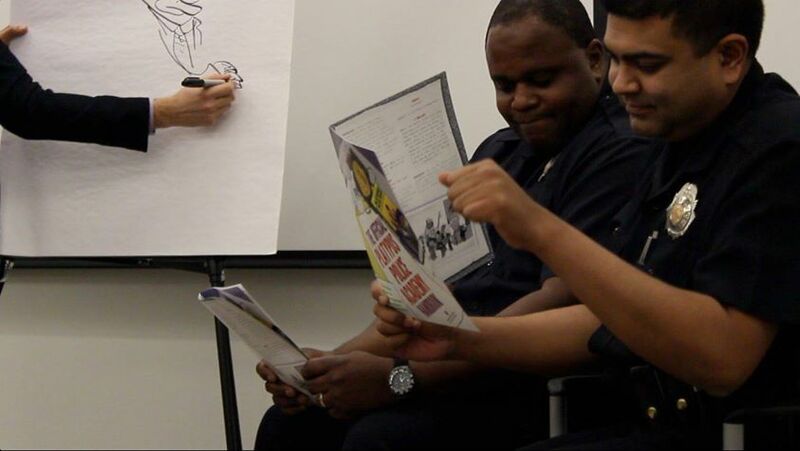 But more importantly, the reading offered them a new way to engage with their community as police officers. It also gave the community a way to connect with their police departments. I read the narration and they read the dialogue. My friends aren’t actors by any stretch of the imagination, but they certainly weren’t shy that evening. The audience laughed as Detective Corey O’Malley chastised his new partner for touching the intercom and prematurely placing a siren on the roof of the car. At the end of the program, I talked with my friends and my publisher about ways in which we could re-create what had just happened that night. 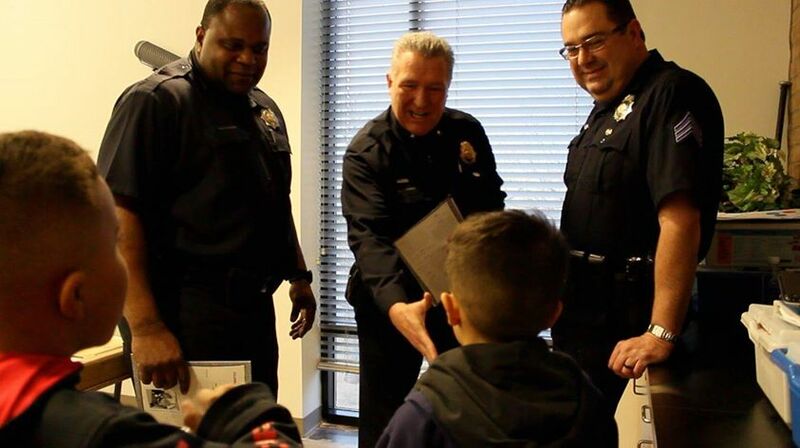 Over the past year, we developed a read-aloud program for communities called Platypus Police Academy, engaging police officers in reading aloud to children at libraries. We created a reader’s theater out of that third chapter from The Frog Who Croaked and an informational packet containing tips for officers on modeling literacy. We piloted the program in Denver, Colorado, and Birmingham, Alabama, and the events went incredibly well. As the police officers read aloud from the reader’s theater, every child in the audience, who had been given his or her own copy of the book, turned the pages together. They giggled in unison. Platypus cops? That’s ridiculous! The officers on hand took their roles as readers very seriously. Some of those officers were a bit nervous before they took the stage, but they were so eager to connect with their youngest community members. There were high-fives and handshakes for all children as they left the library. Everybody walked out of those readings with a shared experience that brought them closer together. Bridges were built through books, further proving that one must never underestimate the power of a read-aloud. The police departments and public libraries in Denver and Birmingham plan to continue to work together for storytime, and numerous other libraries have reached out to their local police departments to start similar programs in their communities. And I don’t want officers to just read my books at these events. We also offer a recommended reading list with the program. Officer Buckle, anyone? Now I’m readying the release of the third installment in the Platypus Police Squad series. Last Panda Standing publishes on May 5, 2015. In this book you’ll meet Jo Cooper, a special investigator who gets brought in to help O’Malley and Zengo solve a difficult case. She’s tough as nails. When O’Malley admires her work ethic more than Zengo perceives his partner to appreciate his own, he begins to feel a bit left out. On the surface these books are about silly puns and crimes that need to be solved by platypuses with badges, but they’re really about friendships and all they entail. Reading aloud to kids? It sure is a big deal. And I hope that the community readers in the Platypus Police Academy program can spread around more of it. Jarrett J. Krosoczka is the author and/or illustrator of twenty-eight books for young readers. His TED Talks have been viewed nearly two million times online and he can be heard weekly on SiriusXM’s Kids Place Live offering book recommendations and tips on creativity. Visit him online at StudioJJK.com and @studiojjk on social media platforms. Excellent! I’ll be those kids will never forget the officers reading to them. Nice outreach idea! Not only are you a talented author/illustrator, you have a tremendously kind and generous heart! Love this idea!